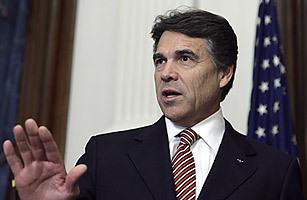 Governor Perry’s Tantrum: So What if Texas Secedes? We’d still visit, of course; relations might not be quite as friendly as with Canada, but certainly warmer than with, say, Cuba. NCAA offcials would have to grant an exception for foreign participation in college bowl games, but I’m betting they’d agree. American Airlines might decide to move out of Dallas, but I’d be O.K. with leaving NASA behind and letting Texans decide if they could afford to return to the moon. Border-patrol costs would be steep, but I’m sure Texas’ application to join NAFTA would be favorably received. And it would get a vote at the U.N. and the right for its diplomats to park wherever they wanted on the streets of Manhattan. Texas would saunter into the global community bigger than Australia, Greece or Bolivia. Who wants a union, founded on high ideals of liberty and justice for all, to be maintained only by force of arms or weight of law I wouldn’t make it easy for a state to unfasten itself; we should require that a two-thirds majority of voters agree. But a Zogby poll last summer found that 1 in 5 Americans thinks states and regions should have the right to leave, which means that the revolutionary DNA of 234 years ago still persists in our bloodstream. Maybe every couple of hundred years, the country should have the debate, just to keep our muscles warm. The secessionist movements alive today in Vermont, Hawaii and California are not really battles between left and right: they include libertarian Marxists and tribal-rights activists and anarchists and greens and every other ideology, all stirred up by their opposition to big national government. America is now a multicultural quilt of 300 million people spread across cities and suburbs and forests and prairies; when it is compared with the colonial world of our forebears, it is harder to judge whether what unites us is greater than what divides us  or agree on just how much power we want to cede to Washington so it can fight pirates and build highways and cure cancer, and how much we prefer to keep for ourselves. While we work all this out, I have an idea for Governor Perry. The 1845 Joint Resolution for Annexing Texas omits the right to secede but affirms Texas’ right to divide itself into five states if it chooses. I’m guessing Austin might want to be a state all by itself and Dallas Cowboys owner Jerry Jones already thinks he is one. This would give Texans 10 U.S. Senators and much more clout. The risk Perry runs if he really dreams of a country all his own is that his state is home to two former U.S. Presidents; and nothing in the 22nd Amendment says one of them couldn’t run for President of the Republic of Texas. See pictures of George W. Bush’s town in Texas.